This is my first blog writing for OpenText. OpenText I hear you say, have you changed companies?, well yes, GXS was acquired by OpenText on 16th January. Now you can read about the acquisition HERE and I don’t really need to cover this in any more detail but I am very positive for the future. Not just for myself in an industry marketing role across OpenText but for the companies that will be able to leverage the software and services from both organisations, it really does provide a strong value proposition for managing information across the entire extended enterprise. As part of my role at GXS over the last eight years I have been writing blogs around B2B integration and looking at the exchange of information from an external trading partner point of view. Now as part of the OpenText family we can help companies address their internal exchange and management of information as well. The traditional world of B2B has been focused on connecting external trading partners together via our Trading Grid platform, the world’s largest cloud based B2B integration environment. The trading partners are typically located across different industries, different regions and each has a different requirement from a document exchange and connectivity point of view. I have been working with manufacturing companies, from a vendor perspective, for over twenty years now and it has been interesting to understand how they structure their operations both internally and externally in order to compete on the global stage. In my former company PTC, a global provider of software based Product Lifecycle Management (PLM) solutions, there was a strong focus on data management and collaboration across internal departments. These departments needed to utilise 3D design based information in many different ways and the information was exchanged across the business depending on whether you were in design, production or the aftermarket service department. Much of the design related information is stored centrally in a design repository, which is typically accessed by a web portal type environment. These web based environments are crucial to supporting the continued globalisation of today’s manufacturing industry. So this covers the management of design based information but what about other types of information that could be flowing across a manufacturing business?, for example test reports, assembly procedures, product presentations, industry analysis reports, sales reports, compliance documents and other media such as video and audio files? Welcome to the world of Enterprise Information Management (EIM), a world where ‘unstructured’ information is managed using a common platform to allow all stakeholders across the business to be able to access any type of information. Most manufacturers have setup ERP and database environments to manage different aspects of their information flows but once inside a database this information becomes ‘structured’. Even information contained within an Excel spreadsheet is considered structured in nature. From a B2B perspective EDI related documents could be considered as structured information because the documents are created using a specific EDI standard such as EDIFACT or ANSI and will contain a standard header describing the content of the EDI document. But what about a PDF document for example?, lots of textual information but unstructured in nature, in a similar way Powerpoint presentations have lots of information on each slide but it is not structured in any way. The management of unstructured information, especially information that lives outside of a traditional database needs to be managed and accessed more effectively. The high level diagram below illustrates a typical manufacturing company where ERP and PLM systems are central to design and manufacture of today’s goods. Another new IT term or TLA (Three Letter Acronym) is just starting to get on the agenda of global CIOs, namely the Internet of Things (IoT). This is a subject that I discussed extensively in an earlier blog, HERE. In summary it is estimated by some analysts that over 200billion devices or machines will be connected to the internet by 2020, representing a market opportunity of potentially $14.4Trillion. There are really three components to an IoT device, the sensor, the WiFi/Network connection and the on board processor to monitor all the information coming from the sensors on the machine. Now it is interesting to note here that the term ‘Big Data’ started to be discussed two years before IoT went ‘mainstream’ in 2013. Many companies are still at the very early stages of learning about IoT, some are simply trying to work out which devices or ‘Things’ could be connected to a network. But with billions of devices connected to the internet and Petabytes of information being extracted from machines around the world, it presents an interesting challenge in terms of how this particular set of unstructured data will be managed. It also presents the ideal opportunity for companies to develop their own Big Data strategies as well. IoT information would for example be taken from connected utilities infrastructures, office equipment, production machinery and warehouse & logistics equipment. The information would typically contain for example proximity, temperature, performance or stress loading related information. All of this information needs to be captured and in some cases processed in real time, and in other cases archived in some form of storage server for downstream processing by other business systems. Combined with the existing information that is flowing across the extended enterprise, what would a typical information management and exchange environment look like in the near future? 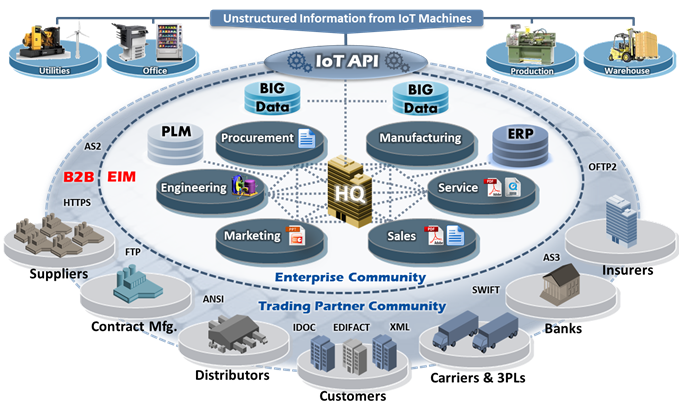 In my earlier IoT related blog I included a diagram of how the IoT could potentially connect with a B2B platform via a dedicated API, now with EIM in the mix as well I thought it would be good to try and update this diagram. I will stress that the following diagram is my own opinion on what a future EIM/B2B/IoT environment could look like moving forwards. However at a very simplistic level I think it contains some of the key building blocks for a future EIM/B2B/IoT infrastructure to support a manufacturing operation. The IoT presents an opportunity to connect the digital and physical supply chains together and develop more closed loop business systems that are more responsive to changing real world business environments. In my earlier blog I highlighted three scenarios of how this could benefit supply chains, namely proactive replenishment, pervasive visibility and predictive maintenance. In future blogs I will expand more on these closed loop business scenarios and the broader role of EIM in the context of today’s manufacturing sector. Two weeks ago I co-hosted a Twitter chat in partnership with The Business Value Exchange relating to IoT and the impact it is likely to have on the CIO,here is a quick recap of the main discussions that took place.